Thomas Engelmann holds a master's degree in Computer Sciences from the University of Hamburg. He started his work experiences in the areas of process redesign and IT system implementation. 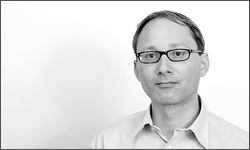 In 1995 Thomas joined CSC Index in Munich working on corporate-wide business redesign projects as a senior consultant. In 1999 he became an independent consultant working on large-scale change and reorganization projects and later joined the Launch Institute network as the European partner, focused on corporate innovation and new business growth. He helped clients to organize their corporate innovation management and to improve dramatically their innovation portfolio through cross-business innovation and empathic market sensing techniques. Thomas has been working with Martin Herrmann since 1996 and joined Herrmann & Associates in 2005. Besides his work in complex change projects he has been facilitating ChallengeX leadership courses and Change Curriculum programs. Since several years he has started with in-depth research on values and ethics and how companies can put the human dimension into the centre of their action. Thomas's clients to date have included Vodafone, EADS, O2, Nokia, Siemens, EnBW, Air Liquide, Eaton, BASF, Munich Re, InBev. He ist the author of "Business Process Reengineering", published in 1995.